Many predict this will be the most active and deadly decade on record in the South Pacific for natural disasters. Following our Disaster Response efforts in Vanuatu (Cyclone Pam in 2015) and Tonga (Cyclone Ian in 2014), we found that due to the logistical difficulties of reaching them, thousands of villagers living on the remote islands were the last to receive aid despite the fact that they were often the most in immediate need. 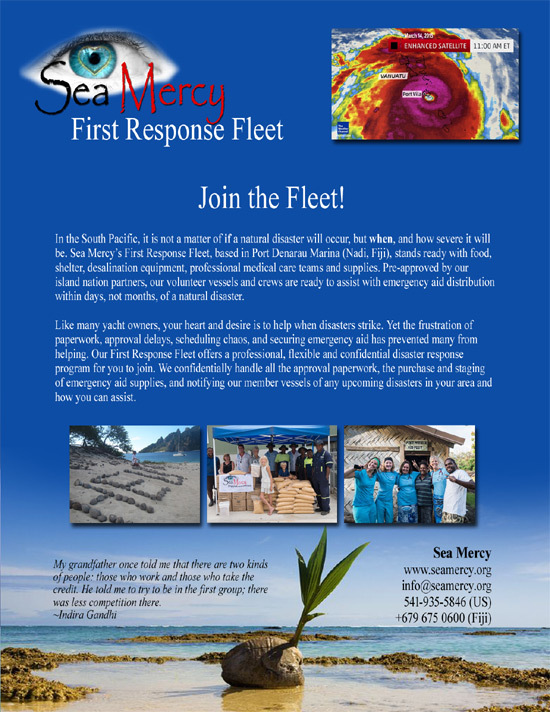 To meet that need we’ve developed the First Response Fleet (click for more information), a program that engages the yachting community during the most crucial first 30 days following a natural disaster. We would like to extend an invitation to you and your crew to consider the various ways you can play a vital part in this important program. Pre-approval of vessels - Operating under a Memorandum of Understanding (MOU) with our island nation partners, our vessels, crews, medical teams, and emergency aid can sail directly to the affected “at risk” islands pre-approved. Professional Disaster Response Support Teams - Our highly trained Professional Disaster Response teams are standing by to provide added security, trained medical staff, and support for your vessel and crew (or we can pre-train your crew). Staging of Emergency Aid, Water & Medical Supplies - We stage our emergency aid equipment and supplies in Port Denarau, Fiji for quick and easy loading of your vessel (marine & land based desalination equipment, Food, Life, Medical and Shelter units). Thank you for your consideration of this First Response Fleet invitation and please contact me with any questions.